Juliana's favorite song right now is "Scream" from High School Musical 3. Most afternoons you can find her in her room with the track on repeat as she sings along at the top of her lungs the words: "I want my own thing, so bad I wanna SCREAM!" Because she is all about being oppressed and having her true self stifled by the man. So when a friend of mine this past week who I haven't seen in a couple of years looked at me and said "I think you need your own thing. You haven't quite found it yet," my first reaction was Ok Dr. Puri, do you always psychoanalyze people over veggie burgers and beer?. And then my second thought was, Fine. Yes. Why do you have to be all right and stuff? Gawd. 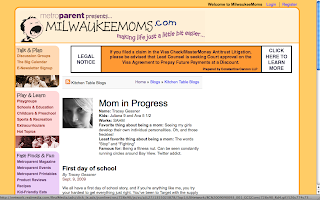 My blog at MilwaukeeMoms.com! I should be posting there once a week. I'm currently working on OTs #2 and #3 and will elaborate soon. One involves a fitness website for our country's drunkest city and the other is a finally-to-be launched etsy store that I've thought about for what seems to be forever and is almost ready to launch. Yes indeedily, goodness will soon be abound.